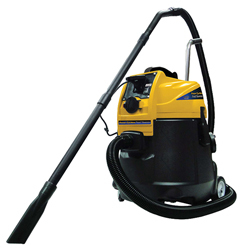 The suction motor will vacuum up to 1500 gph. The internal discharge motor is 1 HP and is capable of discharging your dirty water under pressure up to 18 feet in elevation. The motors are balanced in flow rate so vacuum job is continuous without interruption. The 6 foot extension pipe combines with 26 feet of suction hose allowing for easy handling during even your biggest pond vacuum jobs. 4 different size vacuum heads are included. Debris is vacuumed into the 13 gallon holding tank whereby large solids are collected into a pre-filter bag first. The dirty water is then pumped out to waste by the action of the internal 1 HP sludge pump. 32 ft of exhaust hose allows the waste water to be pumped to any elevation up to 18 feet high. Total working distance is over 60 feet. An optional secondary exhaust hose can be added onto the end of the discharge hose to gain an additional 32 ft if needed.